I'm sorry. I haven't blogged for a week now. No excuses. I've simply been busy with my other life. Is there any other life besides stamping? You betcha! It mostly involves the business side of life and my life has two businesses as well as the normal household stuff. I, also, have the boys (whose summer vacation is quickly coming to an end) and we spent some quality time together last week. As I had mentioned in a previous post, we took a trip up to Woodbridge, VA and visited the 'big Lego store' in Potomac Mills. While we were there, we paid a visit to the Ikea store. This was my first time to Ikea. I have heard a lot from other crafters about how wonderful Ikea is for crafting storage solutions. It is!! I picked up some great items and the prices aren't bad either. It will take me some time to get organized enough to get my new stuff up and in use. I'll be sure to let you see it when I do. Anyway, I was able to do some creating in the past week. So, I have plenty to show you in the coming week. My Girl's Night Out was last Thursday and I was busy designing for that. Two of the projects were designed previously. You can read about them here and here. 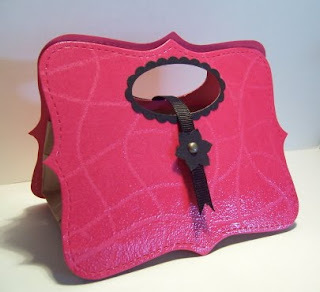 Being a 'Girl's Night Out', I thought that this wonderful little clutch purse would be fun to do. IRL, it's adorable and is so much fun to do. I had first seen this faux leather technique done here on YouTube. It's a great tutorial on how this technique is accomplished. It is super simple and I'll briefly tell you the steps. For this clutch, I cut two Top Note dies in Melon Mambo using my Big Shot. Completely cover the top note with VersaMark and then cover with Clear Embossing Powder. Use your bone folder, or any other tool, to make your lines in the powder. Heat emboss until all EP is melted. I punched the handles using the large oval punch. The trim around the handles uses the lrg. oval with the scallop oval punched around it. Adhere to clutch using 2-Way Glue pen. The 'clasp' is simply a piece of black grosgrain ribbon with two flowers punched from the Boho Blossoms punch and a couple of brads (one on the front and the other on the back). I used a hardware bag trimmed short to adhere my top notes to...creating the 'inside of the purse'. It's perfect for holding small trinkets or a handful of small chocolates! Check out this Top Note goody I have posted on my business website. It's the same assembly just a different theme. I thought this was a great project this week...a small clutch. Especially after my trip to the 'Big Lego Store' and Ikea!! I certainly don't have need for a large purse...I no longer have anything to put in it...(cough cough). Well, I hope you've been inspired to try one of these cute clutches. If you have any questions on how to do it, feel free to let me know. And feel free to leave comments on this post as well. Have a great day. I'll post again in the morning.